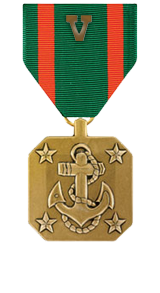 For heroic achievement while serving as section leader for Company L, 3d Battalion, 3d Marines, Combined Joint Task Force-76, from 08 November 2004 to 15 June 2005, in support of OPERATION ENDURING FREEDOM in Afghanistan. During a mounted patrol in the Alishang Valley, his platoon came under fire from a far ambush. Sergeant Fredonis directed suppressive fires on enemy positions while leading marines through a 1,000 meter kill zone under heavy enemy small arms and rocket propelled grenade fire. He quickly had his section dismount from their highback while locating and orienting their fires onto hardened enemy positions while keeping his section moving through the kill zone. He ensured that the Afghan National Army Soldiers that were hiding behind rocks during the firefight were not left behind, as he physically dragged them to their vehicles in order to allow the convoy to keep moving. Throughout the firefight, he fearlessly led his squad and afghan soldiers through counter-ambush actions which allowed the convoy to escape with no injuries. His personal initiative and unswerving devotion to duty reflected credit upon himself and were in keeping with the highest traditions of the Marine Corps and the United States Naval Service. Heroic achievement while serving as squad leader, Combined Anti-Armor Team, Company L, 3rd Battalion, 3rd Marines, Combined Joint Task Force 76, from November 2004 to June 2005 in support of OPERATION ENDURING FREEDOM in Afghanistan. Throughout the deployment, Sergeant Palmer implemented an aggressive training regimen while concurrently providing outstanding convoy security in support of the company’s high operational tempo. During an ambush on his convoy in the Alishang Valley of Lahgman Province, Sergeant Palmer directed suppressive fires in order to allow the convoy to push through the kill zone to safety. Heavy small arms, machine gun, and rocket propelled grenade fire from hardened positions approximately 900 meters away, Sergeant Palmer, in the lead vehicle located the enemy positions, and directed his marines’ heavy machine gun and small arms fire onto them. Sergeant Palmer’s aggressive movements and direction allowed the convoy to escape without injury after a firefight that lasted approximately 30 minutes. Sergeant Palmer’s courageous actions, initiative, and complete dedication to duty reflected credit upon himself and were in keeping with the highest traditions of the Marine Corps and the United States Naval Service.